Free Shipping on Shell Sets in the USA! The Conjuring Cups were designed to conjure your routine in any way you prefer to use them. The only limit to them is your imagination. 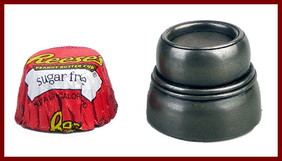 These mini cups can be used for the shell game with soft peas or cork balls. The mini cups also stack well to do a mini cups & balls type routine or do both together in your routine. The cups were made so a mini Reese's Peanut Butter candy cup can fit inside the cup to work very well for a final load. 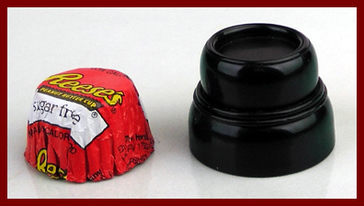 Where the candy will stay inside the cup and will fall out when the cup is taped on the surface for a candy wrapped sweet eatable surprise. This is an easy set to carry with you. Packs small and easy, but shows big for close-up magic. The set comes with a cup bag and an accessory ball bag. All of the bags with the items can then be put in a glossy white carry tube, where nothing rattles around inside. The opening cap has a ball chain to open easy or to hang it up on something. The tube is 1-1/2" diameter x 3-1/2" long. This type package we started doing, where a sticker label can be put on the bottom cap that can be marked for what item is in the carrying tube. The set carrying tube can fit in a magicians case very well or even in your pocket. Cups: 1-5/16” outside bottom base - inside bottom base 1-1/8"
Top of the cup can hold four 5/16" cork balls or three 3/8" balls and nest another cup. The Nickel Silver Conjuring Cups were designed to conjure your routine in any way you prefer to use them. The only limit to them is your imagination. These mini cups can be use for the shell game with soft peas or cork balls. The mini cups also stack well to do a mini cups & balls type routine or do both together in your routine. The cups were made so a mini Reese's Peanut Butter candy cup can fit inside the cup to work very well for a final load. Where the candy will stay inside the cup and will fall out when the cup is taped on the surface for a candy wrapped sweet eatable surprise. This is a easy set to carry with you. Packs small and easy, but shows big for close-up magic. The set comes with a cup bag and a accessory ball bag. All of the bags with the items can then be put in a glossy white carry tube, where nothing rattles around inside. The opening cap has a ball chain to open easy or to hang it up on something. The tube is 1-1/2" diameter x 3-1/2" long. This type package we started doing, where a sticker label can be put on the bottom cap that can be marked for what item is in the carry tube. The set tube can fit in a magicians case very well or even in your pocket. * Flat surface around the entire shell. * Crimp side edges for easy handling. * Can load pea from top and bottom. * Controlled flashing of pea without any lifting of the caps. when moved in any direction. This is big advantage! * Player can place the pea through the top hole of the cap of their choice to start the game. * Pea can be brought in and out of the caps with undetected ease, known only by the magician. * Caps and pea can be fully examined together without switching anything out. * Can perform on any flat surface. * The new natural handling of the caps gives more control with a more full view of the caps. The Bottom Ridge Flash Caps brings more features without any clues on how it is all done. With these new features you will be able to perform some fresh new routines with the spectator being more involved to bring more entertainment and more control of the game. The Flash ~Caps are another new original design by Kind Design Products keeping up with the modern times for the magician. The shell game played on the streets today for the real con game are normally using bottle caps and a crew of shill's to sell the con. The Bottom Ridge Con-Caps are the best con caps ever made for a con on their own without any crew to sell the con for entertainment. ﻿﻿Why they are the best con caps?﻿ ﻿﻿The shell game is a confidence game and what normally brings the confidence is the mark seeing others winning. The mark is unaware that the others that are winning are all part of the con. The standard type caps can not sell the con on their own, because the shells or caps will always bring an unfair game. This is why they can never be touched. As it would reveal how the game is unfair and would see that they can never win. The new Bottom ridge design changes all of this; these caps can bring a fair game and everything can even be examined if need be. Without switching anything out. This can bring the confidence that they do have a chance to win. Without having a crew in play. But at anytime after you have established the confidence of the con you can make it an unfair game to win for the surprise. All of our products are designed for entertainment, but it is more like the real con game being displayed. Any con game is always best with a crew to sell the con. But a crew is never used with the entertainer and these caps will bring a real secret to your game to even fool the ones that know how the game is normally played. You have full control on everything you do. Without any clues, rules and nothing to hide!